Use your Stitchex Mobile App to manage your Customers' profiles. If you (or your agents) are "on the go", you will meet new customers and will have a way to add their contact information to your Customer database. 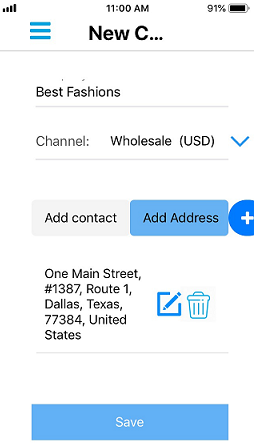 Or, if you are visiting your customers and their contact information has changed, you can update this information from your Stitchex Mobile App as well. By entering this information directly into your Stitchex Mobile App, you do not have to "take notes" and remember to enter the data later when you get back to the office. And, the information is automatically synchronized to the main Stitchex systems so that all of your Agents can have visibility to the new information as it becomes available. To add a New Customer, select Customers from your main menu (top right blue bars). Type your customer's Company Name in the Company Name field (Figure 1). 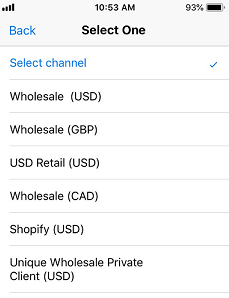 Click on the blue drop down arrow next to "Select Channel" to select the pricing Channel this customer will be associated with (Figure 1). Select the pricing Channel for the customer (Figure 2). Click on the Add Contact button (Figure 1). Click on the "Plus Sign" (Figure 1). Enter the customer's name, phone number and email address on the presented form. Note you may have to scroll down to see the full form. 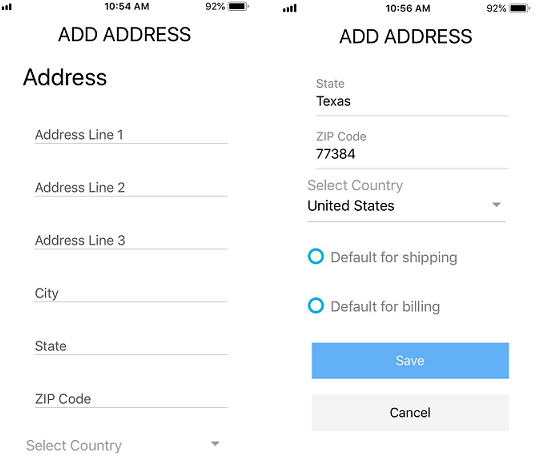 Also specify whether the address is to be the default for shipping or billing by clicking the appropriate radial buttons. Click on the Add Address button (Figure 1). Enter the customer's address on the presenting form. Note you may have to scroll down to see the full form. 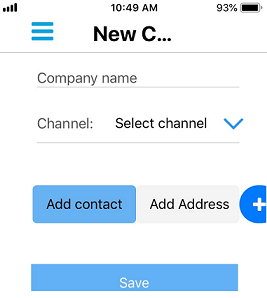 After entering the company name, channel, address and contact information, Click Save on the New Customer profile sheet: (Figure 5).